In the hospitality world, fire is a very real threat. When it happens, the effects can be devastating. 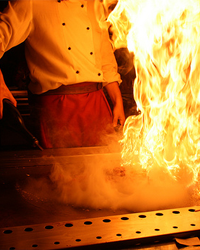 There are no areas in a typical hospitality venue that are completely fire proof. Kitchens are of particular concern due to the nature of the plant and equipment that are commonly used in most commercial kitchens. To help you manage fire hazards in your kitchen, I have put together a checklist so you can minimise the risk of worker injury, business impact and asset damage. Fire Safety and Emergency Preparedness are strictly legislated. Do your kitchen personnel know what equipment is available, its location and how to use it in the event of a fire in their area? All workers at your establishment must be taken through General Evacuation Instruction a First Response Training Program within the first 2 days of employment and then every year and 2 years respectively thereafter. There are also strict maintenance requirements associated with fixed and portable firefighting equipment. For example, all fixed fire hoses, portable fire extinguishers and fire blankets, must be tested and tagged by a competent person every 6 months. Records of this must be maintained and be readily available upon request from regulatory authorities. All areas must be kept clean and grease free. A well-established cleaning schedule and procedures will ensure that this is achieved. Oils, spirits and fats must be stored away from a possible ignition source. This includes gas hot water systems with pilot lights. All kitchen workers must be aware of the location, type and use of any alarm system, the correct use of extinguishers, including extinguisher types, the correct use of fire blankets, the location of gas shut-off valves and the location of the kitchen’s extraction hood shut off switches. a) Raise the alarm and evacuate the area. Only try to extinguish the fire, if it is safe to do so. b) Ensure the oven door is closed. Turn off the power or shut off the gas (if it is safe to do so). Obtain either a Carbon Dioxide (CO2) or Dry Chemical Powder type extinguisher. Keep below the top of the door. Open the door and insert the extinguisher nozzle. Discharge to extinguish the fire and shut the door. Stay at the side of the oven. Carefully open the door and insert extinguisher nozzle. a) Raise the alarm and evacuate the area. Only try to contain the fire, if it is safe to do so. b) Turn off the power or shut off the gas (if it is safe to do so). c) Slide a close fitting metal lid over the vat – if one is available. d) Approach the fire with the fire blanket, holding the blanket in the correct manner. Place the blanket gently over the fryer and seal the edges. Leave the blanket in that position and do not lift the edges to check whether the fire is out for at least 30 minutes. e) If a fire blanket is not available, a Wet Chemical Extinguisher should be used. Always point the discharging wet chemical stream at the side of the vat, so that the wet chemical forms a blanket over the top of the burning oil. f) Always ensure that the power source is isolated and turned off to prevent re-flash. Do not use water extinguishers or fire hose reels on fat or electrical fires.